One of the biggest problems or concerns with household products is the exposure to harsh, dangerous and stinky chemicals. HinderRUST is solvent free and has virtually no organic compounds. We are one of the safest rust prevention compounds and lubricant on the market approved for indoor and outdoor use. From construction and carpentry to at home DIY projects and everything in between, tools and equipment are expensive and much less useful when rusted, stuck, or simply not operating at peak performance. Using HinderRUST to properly maintain rust-free equipment that operates efficiently also means being able to quickly free up stuck parts and make repairs. 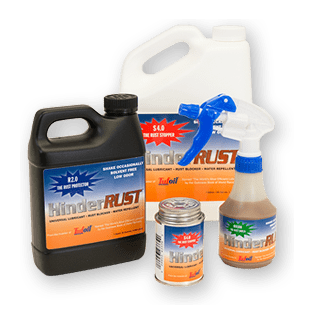 Try HinderRUST today and we are sure you will never need another rust prevention product.